The internet basically lost its composure entirely when 50-year-old Milind Soman managed to complete the Ironman triathlon at Zurich earlier this year. It was partly his age and partly his celebrity status that allowed him to collect the volume of accolades he did, though we doubt any man who can swim, run, and cycle across chosen terrains for kilometres at a stretch, for over 15 hours, is in it for the fame at all. To win the title of ‘Ironman,’ participants are required to complete a 3.8 kilometre swim, a 180.2 kilometre-long bicycle ride, and a 42.2 kilometre run race in this exact order within 16 hours, so it goes without saying that he’s worthy of respect. But what about the other Indians who have achieved this feat too? From pilots to IT engineers, marketing managers to tech entrepreneurs, we uncovered all sorts of unlikely Indians, from all walks of life who have participated and completed this race without enough of us being aware of it. 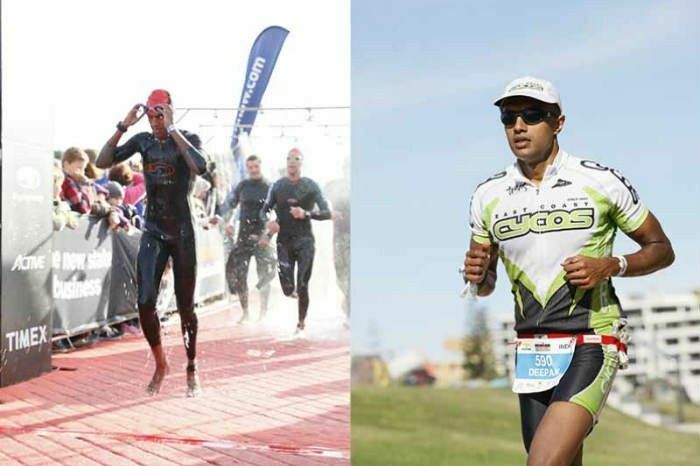 We managed to speak to them too, understanding the immense discipline it takes to juggle personal and professional lives, along with training sessions just to win the title of ‘Ironman.’ If you needed the inspiration and motivation to believe anyone can do this if they set their mind to it, these 11 individuals stories are bound to do you a solid. As a result of his demanding work schedule, he has made it a point to design his workout depending on wherever he’s staying the night. Every week, he does 3 workouts of each discipline and when he isn’t flying, he trains and catches up on his sleep. Currently, he is working towards participating in the Ironman 70.3 (1.8km swim, 90km bike and 22km run) next year, which will be held in Australia. 24-year-old Arunaabh Shah, born and brought up in Delhi, is a former national level swimmer. Last year, he took part in the Ironman 70.3 for the first time and finished it in an unbelievable 5 hours, 33 minutes and 32 seconds, thereby finishing 9th in his age category (18-24) and 149th out of 1500 finishers. An ardent distance runner who has never finished below the podium for any ultra distance races, training for running wasn’t a Herculean task. However, he was’nt equally prepared for the swim and bike races. Just two months before the race, he even crashed his bikes, chipping off two of his teeth and was forced to take a break from his training. After the incident however, he began working with a coach so that he could structure his training which helped him tremendously. Currently, he is training to participate in Ironman Mallorca, which will take place on September 26 of this year. He has also been working out relentlessly in the hopes that he will qualify for the World Championships in Hawaii. 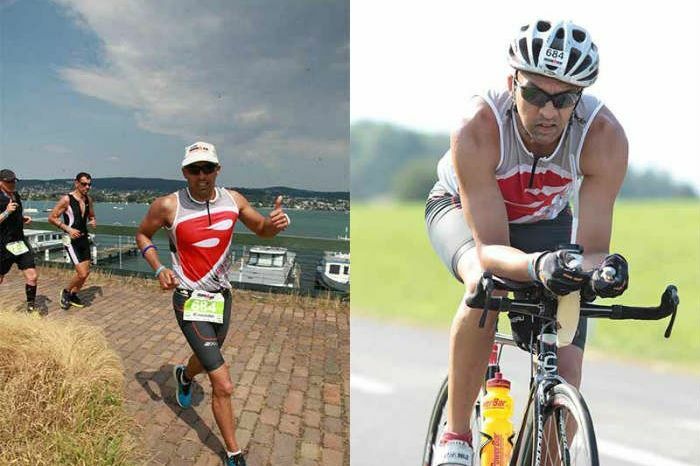 38-year-old Deepak Raj, quit his corporate job so he could become a triathlon and running coach and thus, he started his own venture called Tri A New Life in 2013, with the single-minded mission of popularising triathlons in India. A qualified and accredited coach for running, cycling, swimming and personal fitness, he has worked and participated in races across Australia, Germany, Japan, USA and India. He has successfully completed 13 Ironman triathlons until now, with a personal best time of 10:19:08. He participated in his first Ironman in 2008, when he was 30, after training on his own. Even though he had a running background, he had to train intensively for swimming and cycling. As his endurance level increased, he increased the intensity of his training, as well. He would try to swim/bike/run, at least 3 times each with a few long sessions in each of the segments. He even participated in a Half Ironman as a preparation. 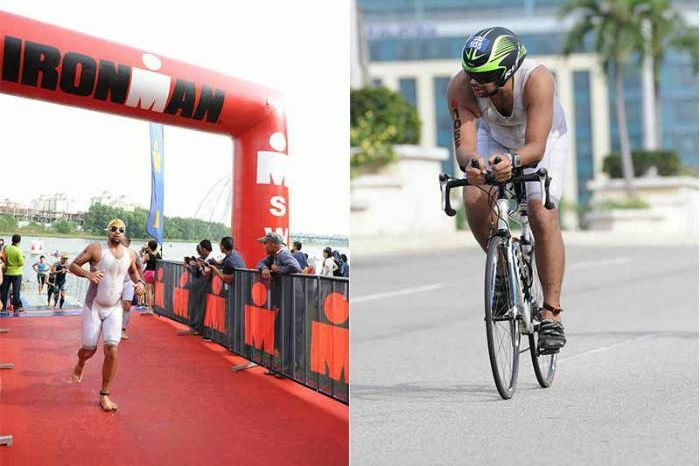 He is currently training for the Ironman Malaysia, this year. Hiren Patel is a 27-year-old IT engineer with Infosys Pune. Raised in Kosamba, Gujarat, he moved to Pune for his job and it was here that he started training for endurance races. He attempted the Ironman for the first time this year in July and he successfully finished the race in less than 16 hours. Swimming was new to him and so for the first 8-10 months he focused on swimming with a little bit of cycling and marathon training. Once, he built up his stamina for swimming, he followed a schedule where he would do strength training on Tuesdays, and Wednesday to Thursday he would swim for an hour followed by a 45-minute-long run. On Saturdays he would swim for 1 and a half hours and cycle for 100 kms while on Sundays he would run for 20 kms. 33-year-old Kaustubh Radhkar is a former Indian national champion swimmer who has represented India in various swim meets from 1997 to 2001. He has completed the Ironman 12 times and he is the only Asian to have finished the race in all the 6 continents where it is held. He was the overall winner for the swim for two of these races and for all the other races, he was always one of the top 10 out of the water. His first race was in 2008 in Arizona, and at the time he was living and training in Boulder, Colorado which is considered to be the Mecca of triathlons. Since he had a lot of support, training for the triathlon wasn’t so hard for him. During the race, he was the first amateur out of the water with a time of 47:30, and ever since, he has never looked back. Through the course of the bike race, he had two flat tires buthestill powered his way to the finish line. His workout schedule to help him prepare for the meet required him to train for 18-20 hours a week. Despite working full time, he made it a point to go swimming for 4 days, running for 5 and riding at least 3-4 times a week. He recently competed for his 13th Ironman on August 2, 2015. 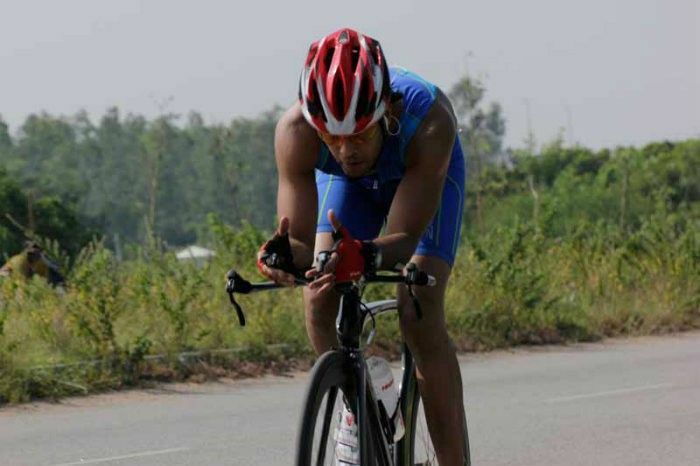 Mehul Ved has been cycling as a hobby for the past seven years, running for the past three years and participating in triathlons for two years now. He has completed two Ironman 70.3 races, until today. 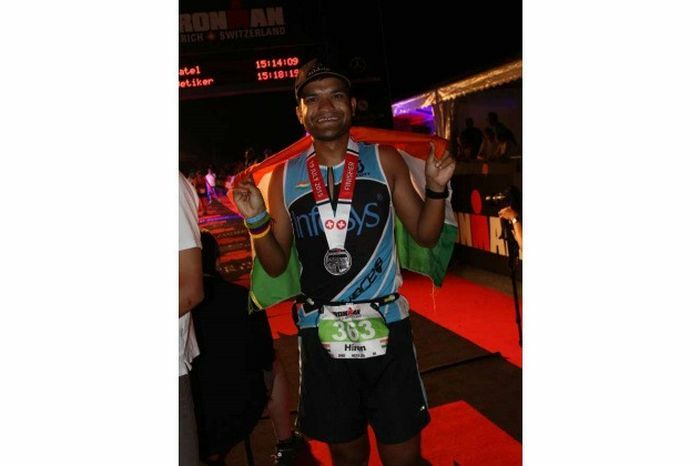 His first ever Ironman was in 2014, held in Putrajaya, Malaysia and during the race, he overexerted himself, which caused him to start cramping towards the end and that ultimately slowed him down. It took him 7 hours 3 minutes to complete the race, but he learned a valuable lesson. For his next race in Hawaii, he took it easy on the swim and he managed to finish the race in 6 hours and 34 minutes. For the competition, he trained for 10-12 hours a week (1.5-2 hours a day on weekdays and 3-4 hours a day on weekends), which was made up on a routine of 4 sessions of swimming, 3 sessions of cycling and 3-4 sessions of running. His next target is to participate in a Full Ironman either in late 2016 or early 201 and also in the Olympic and Half Iron distance races within India as well. 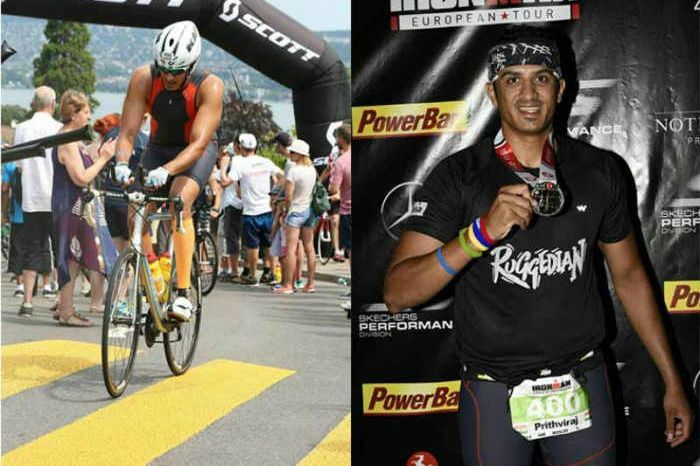 26-year-old Prithviraj Vijayrao Patil completed his first Ironman on July 19 of this year at Zurich in 15.52 hours. He started training 6 months prior to the meet and it wasn’t easy since he had to juggle between his work, masters classes and workout. He split his workouts into two parts–two hours in the morning and two more at night. He designed his sessions based on what he could find on the internet and the lack of guidance made the whole process harder for him, but he worked tirelessly to make sure that wouldn’t set him back. For him, following a strict diet was the toughest part, but the overwhelming support he received from his friends and family kept him going. When he reached the grounds of the race, he had only two things in his mind–not quitting no matter what, and to finish within a time frame of 12-13 hours. During the course of the race he suffered from a knee injury and his bike tires got punctured, but the countless number of people cheering him on, took him straight to the finish line. 30-year-old Rishabh Gupta juggles the responsibilities of being the CEO/Co-founder for Letsintern.com & Yink and a triathlon athlete quite admirably. 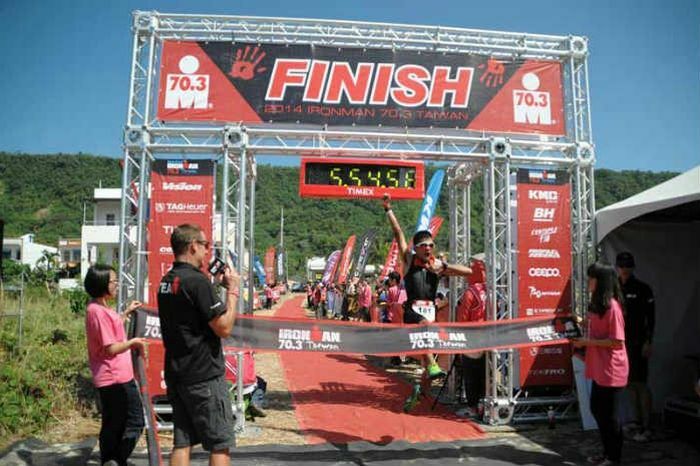 He participated in 2015 Ironman New Zealand and finished in 14:05 hours. The massive headwinds, rains and dulations slowed him down, but he powered through right to the finish line. Apart from Ironman, he has also completed MTB Himachal, crewed for La Ultra in Leh, and done 7 marathons, 4 half marathons, 4 Olympic triathlons. “What I felt after finishing the race was somewhat of an oscillation of achieving something which less than 0.1% of the world does and the disappointment with myself for not going fast enough and finishing with plenty to spare,” he shares. Training while running a business wasn’t all that easy for him, especially with all his travels between Mumbai, Pune and San Francisco, which meant legging the bike between cities for training. He would train five days a week, with at least two pool sessions of 2.5kms, 2 run sessions of 10kms, and a 2 bike sessions–one for only about an hour or two and the other for 4-5 hours. 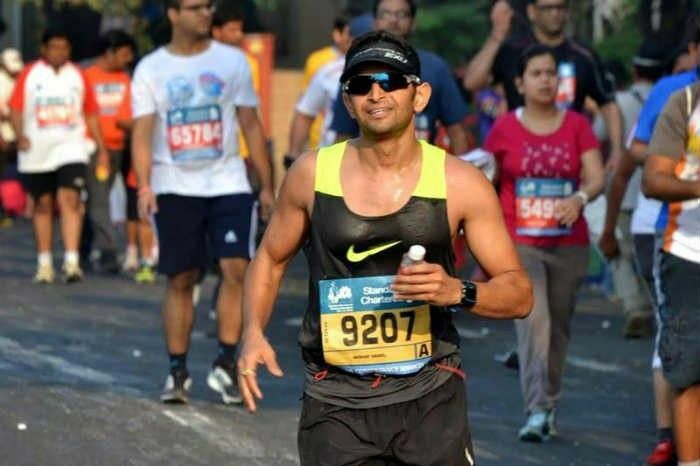 He participated in the Ironman 70.3 in Taiwan and finished in 5:53–an under 6 target is something only a handful of Indian age groupers have managed. He is planning to participate in another Half Ironman and beat his own time and even participate another Full Ironman in either Australia or USA. 29-year-old Solonie Pathania works with a Pune based consultancy called Bridge2Tech as a Manager for one of the teams. As the daughter of an Army officer, she was practically brought up all over the country. She started with running in June 2013 as a means of getting fit and her first novice triathlon was in December 2013 and that is all it took to get her hooked to triathlons. She loved exhilaration and the adrenaline rush she experienced while finishing a triathlon. 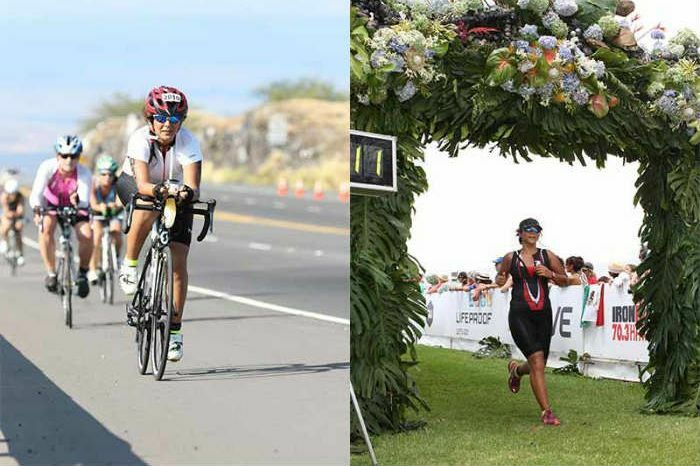 She completed her first Ironman 70.3 in Kona, Hawaii, earlier this year, on May 30. Since it was her first Ironman and her first international race, she was very anxious and unsure of what to expect, but the anticipation pushed to wake up every morning and train. She had kept her target time at a realistic 07:30 hours and about five hours into the race, she a distance marker and realized that she had only 11 kms more to run, which meant that if she pushed harder she could finish the race in less than 7 hours. So, she did and she managed to finish the race in 06:56 hours. For the meet, she trained under the guidance of Kaustubh Radkar. With a full time job, she was on a very tight schedule. Her daily training included 2 of the 3 sports that comprises a triathlon. No two days would be the same in a week – some days she would work on speed, some on the distance and some days would just be an active recovery. “There are a lot of things one needs to juggle – a properly structured training program, diet control and then, probably the most important, recovery,” she shares. She is currently preparing herself to compete at a Full Ironman next year. 42-year-old Sunil Menon, fondly nicknamed as Desi Superman used to run around 8-10 kms around the Botanical Gardens for years, but it was only when he came first in the corporate category at a Hyderabad Half Marathon in 2009, that he realised that he had the potential to not just run, but also win. He participated in several marathons around the country before he participated in his first Ironman. In Februar 2012, he completed the half Ironman at Sri Lanka in 07:18 hours, despite having sustained an injury just two weeks prior to the race. 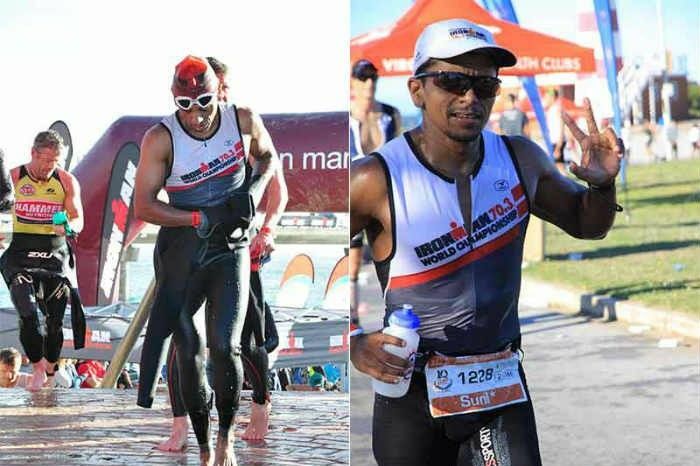 He completed his first Ironman in South Africa on April 6 2014. But for him, the highlight was not the title, but the short essay his son wrote in his exams about this same achievement.He followed a very simple routine of 3 swimming sessions, 3 bike rides, 3-4 runs every week. He has registered himself for Ironman Sweden, which is to be held on August 20 2016 and is training himself for the same. Unfortunately, we couldn’t get in touch with Harsha, but we couldn’t create a compilation like this without mention of his story because it’s a particularly inspiring one. Especially for those who’ve perhaps lacked motivation or self-belief that they could accomplish something like this. His tryst with sports began as way to get fit.Determined to stop all those who teased him for being overweight, he enrolled in a gym and by the time he was in his second year of college, he became a trainer at the same gym that he used to work out in. This journey towards becoming a triathlon athlete was gradual. It was in 2012 that he signed up for the Half Ironman in Sri Lanka. Instead of shaping his workouts for the purpose of the meet however, he simply continues his regular routine that was made up of a few laps of the pool, followed by running a few kilometres and simply cycling to work. He managed to finish the race in 06:37 hours, finishing fifth in his age category. Soon after this, he was involved in a terrible accident that left him with fractures on 4 different parts of his foot. Once he recovered, he decided to take up radonneuring, which is essentially long-distance, unsupported, non-competitive cycling event. A super radonneur is when a cyclist completes the 200k, 300k, 400k and 600k brevets in one calendar year, something he achieved in just a month! In 2013, he participated in his first Full Ironman meet. He faced several hitches during the course of the race, such as losing his bib, but he refused to give up. In 13:17 hours, he completed the entire race gaining the title of ‘Ironman’.